Reprinted from Applied Radiology. 2006;(Vol. 35, No. 4):13-20. Just over 30 years ago, computed tomography (CT) was heralded as a remarkable technology that would change the practice of medicine. CT has certainly lived up to this billing and has continued to be an invaluable tool for imaging evaluation across all ages. 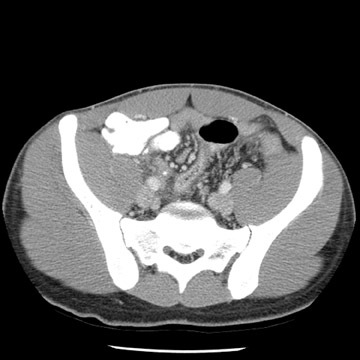 Applications of CT are extensive, including its use as a primary imaging modality, a problem-solving tool, and even recently in a screening capacity. In recent years, advances in CT technology, such as the introduction of helical and subsequently multidetector CT (MDCT), have resulted in a dramatic increase in the number of CT studies performed. 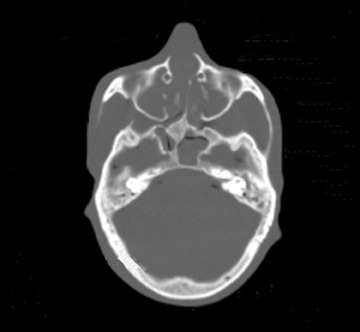 Although CT can be used in a great many situations, the question remains whether CT should be used in these situations. Moreover, when CT is indicated, one must also consider how the CT is to be performed. These questions began to be raised globally only a few years ago following publications in both scientific literature and public media. 1-5 The principal thrust of this material was directly or indirectly addressing the amount of radiation from CT and the potential risks of cancer. Following a series of articles in the American Journal of Roentgenology , and the ensuing media attention, this has continued to be a sentinel issue that involves radiologists, manufacturers, and regulatory agencies alike. Although healthcare professionals agree that the benefits derived from CT imaging studies must outweigh its risks, it takes thought and effort to achieve this balance. This effort is particularly important when considering CT scans of infants and children in whom CT techniques are less well studied and understood, and the potential risks of radiation exposure are relatively greater. To best reach this objective, there must be an understanding of the use of CT, a comprehension of the amount of radiation that CT delivers and the appropriate measure of that exposure, discussion and debate about low-level radiation and cancer development, and a consideration of the methods used to manage the amount of radiation from CT. Therefore, the purpose of this review is to provide salient information for diagnostic radiologists regarding use of pediatric CT, the relevant risks, and strategies to manage the radiation dose. In order to build a foundation for understanding radiation dose and its potential risks, it is important to be familiar with pertinent radiation measures and terminology for CT. Among the most frequently used terms are absorbed dose, effective dose equivalent , and indices of dose; these measurements are determined from phantom measurements, consisting of the CT dose index (CTDI) and dose length product (DLP). Absorbed dose, measured in grays (Gy), represents the actual radiation dose delivered to a specific tissue or organ, such as the breast, thyroid, or bone marrow. While absorbed (or organ) dose allows us to determine biologic effects and risks, it is cumbersome for routine assessment of CT radiation. One would need to either estimate doses based on CT parameters and use mathematical models, or make direct measurements, which is impractical, at best. The dose equivalent, measured in sieverts (Sv), is the product of the absorbed dose and a quality factor. The quality factor depends on the type of radiation. For example, for CT and other X-ray studies, the factor is 1.0. The dose equivalent is used to calculate the effective dose equivalent (EDE). The EDE is the sum of the product of each dose equivalent and a weighting factor for susceptibility to radiation for an individual tissue or organ. The EDE is the equivalent dose to the whole body resulting from general or regional exposure. The EDE provides a useful method to compare doses from different regional radiation exposures (such as brain CT versus ankle CT), and between different imaging modalities (such as radiography, scintigraphy, or CT). Despite the usefulness of EDE, there are limitations. At best, effective dose equivalent is still an estimate for an individual patient. The EDE is typically derived either from mathematical patient models or anthropomorphic phantoms, or by using the CT dose index (CTDI) or dose length product (DLP) (see below) and conversion factors. 32.0 cm. An in-depth discussion of the various and often confusing methods for determining CTDI is beyond the scope of this review and can be found elsewhere. 6 The volume CTDI (CTDI vol ), is currently the preferred measure and takes pitch into account. 6 The dose length product (DLP) is measured in units of mGy·cm. The DLP, in simplified terms, is the product of scan length and CTDI vol . It makes sense that a longer area of coverage will provide a higher dose than a shorter area. This is why CTDI vol itself is of no practical use in estimating dose. It is only a measurement at a single slice. Thus, the DLP represents a better method for estimating dose (that is, the effective dose equivalent), since a larger area of coverage will have a larger DLP than a smaller area of coverage, using the same CT parameters. Contemporary MDCT scanners can display (although may not record) the CTDI and DLP. This serves an important role, as it allows technologists and radiologists an opportunity (if recognized) to assess how individual CT settings will affect dose for that particular scan or protocol. For example, while the actual dose to the patient is not known, selection of parameters that result in a 50% decrease in the DLP will generally result in a 50% reduction in dose to that patient. Trends and patterns: How do we use CT? While the precise number of CT examinations performed in the United States each year is unknown, CT is a frequently performed examination. For example, it has been estimated that up to 65,000,000 CT examinations are performed in the United States each year. 7 This equates 1 CT performed for every 4 to 5 people, based on recent census numbers. In addition, trends show a growth of CT use in recent years. Estimates are approximately a 10% growth in use per year. 8 It is important to recognize that these estimates are several years old and do not include the newest trends and applications of MDCT, especially screening CT. Moreover, numbers do not take into account multiphase examinations, where each phase generally provides what we refer to as a radiation "dose event." 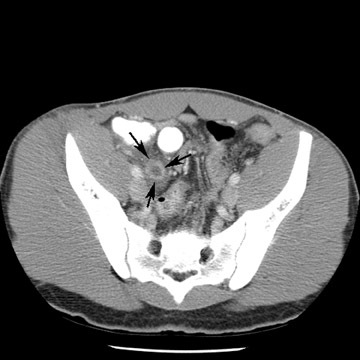 That is, a 3-phase abdomen CT, which is considered 1 exam, actually provides up to 3 examinations' worth of radiation-1 for each phase (if there are no adjustments in techniques between phases). If more contemporary practice patterns were available, and nuances such as the frequency of multiphase examinations were better understood, it would not be unreasonable to expect that the amount of radiation delivered to the population from CT is increasing at an exponential rate rather than a linear rate. Is the relative radiation dose from CT studies recognized? In a recent informal survey of approximately 50 pediatricians, the majority believed that, given its frequency, radiography, not CT, was the greatest contribution to pediatric radiation dose (unpublished data, DP Frush from the American Academy of Pediatrics Meeting, New Orleans, LA, 2003). This supports a recent article in which investigators surveyed radiologists, emergency department patients, and physicians. 12 While it may not be surprising that 100% of patients and 73% of emergency department physicians underestimated the radiation dose from an abdominal CT, 78% of radiologists underestimated the dose, with 5% of radiologists surveyed answering that a CT provided equal to or less than the amount of radiation from a chest radiograph. This underscores the importance of continued education of patients and healthcare workers alike. A CT examination delivers a radiation dose below 100 to 150 mSv, which is the upper limits of the range considered low-level radiation exposure. 14 There is little argument that doses in excess of 200 mSv have a significant risk for the development of cancer. The question is whether the radiation from CT causes cancer. The most defensible answer is no: There is no direct proof that the radiation from CT results in cancer. To investigate this formally would be tremendously costly, primarily because of the large size of the population and the decades of observation that would be needed. What we are left to assess is data from other low-level exposures. Of note, 2 recent articles have addressed the issue of bioeffects and radiation. In the first, published in the British Medical Journal , investigators noted cognitive deficits and a decrease in high school attendance in adolescent boys who received head and neck radiation for cutaneous malformations as young children. 22 In the second article, published in Lancet , estimates of cancer mortality from X-ray studies was discussed, and estimates of attributable risk ranged from 0.6% to 3%. 23 The authors conclude that, in the United Kingdom, this results in approximately 700 additional cancers from radiologic studies. While it is not the intent of the present article to critique these investigations, these articles underscore the ongoing attention to the issue of low-level radiation and potential bioeffects. In spite of these arguments, virtually all experts agree that excessive and unnecessary radiation should be avoided. This is particularly true in infants and children for several reasons: This group has a longer lifespan in which to manifest radiation-induced cancers; their organs and tissues are more susceptible to radiation; and similar radiation exposures to those used in adults can result in a greater dose in children. 24,25 In effect, the debate over the development of cancer and low-level radiation could be simplified by ascribing to the practice that has been the standard for radiologists for decades: Unnecessary radiation should be minimized or eliminated-the ALARA (As Low As Reasonably Achievable) principle. How can radiologists manage CT dose? The first step to limiting CT dose is perhaps the most obvious, but one of the easiest to overlook. As the number of requests for CT examinations continues to rise, radiologists have a responsibility to perform only those studies that are justified. While not always possible or practical, we should not perform a questionable examination because it is easier than trying not to do it-a not unfamiliar position. It has been noted that, similar to other modalities, perhaps >30% of all CT examinations performed on children are not clearly indicated. 26 Because of the increasing use at all ages, it is reasonable to expect that the number of CT examinations ordered for questionable indications will increase as well. While determining the appropriateness of every CT requested is impractical at best, there is a successful (although often time-consuming) method to minimize the number of unnecessary studies. This method is communication between the ordering physician and radiologist. Communication can help to ensure that a different imaging modality, such as sonography or MR imaging, may be substituted for the CT, when appropriate. Along these lines, communication in the form of conferences or lectures on a local, national, and international level to healthcare providers, such as family practitioners, pediatricians, and emergency physicians, can address both the issues of CT benefits and appropriate applications as well as risks. Once it has been agreed that CT is the study of choice, the radiology team also has a responsibility to apply CT protocols or techniques that are adjusted based on various considerations. These considerations include indication for the scan, region scanned, and size of the patient. The CT technical parameters can be adjusted based on indication. While individual parameter adjustments for the common applications of CT have not been completely addressed, in general, reductions in tube current should be considered in situations in which the abnormality will be large or will exhibit high contrast. For example, evaluation of renal calculi can be performed at a lower tube current because of the high contrast nature of stones. 27 Scan settings should also be appropriate for different regions of the body. It has been recognized that chest CT for evaluation of lung parenchyma can be performed at a lower tube current, reducing the dose. 28,29 Skeletal CT also lends itself well to reductions in tube current, given the high intrinsic contrast of bone versus soft tissue. Finally, scan parameters need to be selected based on the size of the patient. 30,31 This is a necessity in pediatric CT, given that patient weight can vary by a factor of more than 100. To make these adjustments in scan techniques, it is necessary to have a basic understanding of the contributions to image quality and radiation dose for those parameters that are selected for protocols or individual examinations. Guidelines for parameters for pediatric body CT are found in Tables 1 through 4. These parameters consist of tube current (milliampere-mA), gantry rotation time (seconds), kilovoltage (kVp), pitch, table speed (mm per rotation), and detector configuration (number of detector rows and detector thickness). CT technologists should also have an understanding of these parameters and their effects, since these individuals will often be the first and only determinants of techniques. Tube current determines the amount of photons delivered by the X-ray tube. The higher the tube current, the greater the number of photons and the less the image noise, or mottle. Adjusting the tube current should be an obvious starting point for reducing the amount of radiation delivered to children. Because of their smaller size, children do not need to be exposed to the same tube current as do adults. While decreasing tube current will decrease scan quality, studies based on a simulated tube current reduction technique 32 are being conducted that determine detection thresholds for mA for several different scan indications such as appendicitis and renal calculi (Figure 1). Gantry cycle time will also affect the amount of radiation delivered by a CT scan. Holding all other parameters constant, faster cycle time will result in a proportionate decrease in radiation. For example, by reducing the cycle time from 1.0 to 0.5 seconds, the amount of radiation delivered is decreased by 50%. In general, we use the fastest cycle times in children for several reasons. The motion from the heart and lungs (in non-breathhold examinations) will be decreased. In addition, the faster the examination can be completed in children the better, since they may have limited ability to hold still or hold their breath. This means, for a 75-mA examination, we would use 150 mA at 0.5-second rotation time instead of a 1.0-second rotation time and 75 mA. Pitch is another factor that contributes to radiation dose. In general, we have found no benefit to performing an MDCT at pitches <<1.0 except in very young children. In this group, more so than in larger children, our experience has been that the streak artifact at interfaces with a large difference in attenuation (such as air-filled bowel and liver) is more troublesome as pitch increases. In very young children, we will generally resort to a pitch just under 1.0 (Table 1). For CT angiography, higher pitches (with narrow detector width for thinner slice acquisition and improved rendering) provide excellent quality (Table 1). Increasing the detector width (eg, from 0.625 to 1.25 with the GE 16-slice scanner) while keeping other parameters constant will also result in a lower dose. However, the ability to obtain thinner slices will be limited. The selection of these parameters will, therefore, need to balance these factors. For general body CT in children, detector thicknesses of 1.25 mm for 16- and 8-slice, and 2.5 mm for 4-slice examinations (LightSpeed, GE Healthcare, Waukesha, WI) are usually adequate. 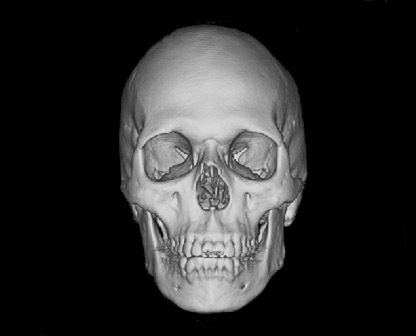 Thinner detector widths can be selected when high-resolution multiplanar and 3-dimensional reconstructions are anticipated, such as with CT angiography, skeletal assessment, and airway evaluation. Tube current reductions and their effect on study quality is also being addressed systematically (using a research tool) in adult and pediatric CT. 32 With this technology, noise is added to the CT projection data set to simulate lower tube current. Initial assessment on study quality suggested that reductions of up to 67% were possible for pediatric body MDCT. Further efforts with simulated tube current reduction include assessment of dose reduction and diagnostic quality for pediatric head and neck CT.
We examined both water phantoms and skull phantoms using a 16-slice MDCT with parameters identical to those used in routine institutional craniofacial MDCT studies. Noise and anatomic detail for the skull phantom were evaluated. The conspicuity of anatomic regions in the simulation versus those in the actual reduced-mA examinations was determined by consensus evaluation of 3 neuroradiologists who were blinded to the mA of the scan. Most importantly, review of the images by 3 faculty observers demonstrated no difference in the conspicuity of major bony anatomical structures (Figure 2; unpublished data, S. Mukundan, Duke University Medical Center, Durham, NC, 2004). The simulated tube current reduction tool is currently being applied to head CT obtained to assess for ventriculoperitoneal shunt malfunction as well as sinus disease. CT is a powerful imaging tool. 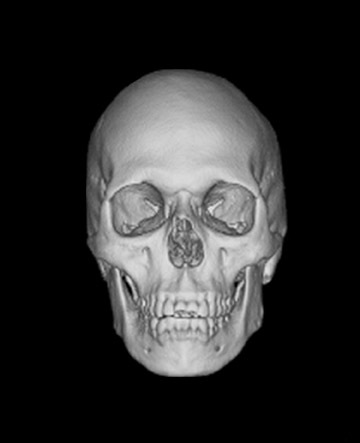 With the technologic improvements of MDCT, the number of CT scans being ordered is rapidly increasing. However, for all of its benefits, there are potential risks to the injudicious use of CT. Over the past few years, attention has been focused on an acknowledged, but often underappreciated, risk of CT use in the radiation dose and potential cancer risk. In order to address the issue of CT and radiation, radiologists must have a working understanding of the widespread and increasing use of the modality, the basic measures of CT radiation, the potential risks of radiation exposure, and the strategies for management. With this understanding, radiologists can continue to educate clinical colleagues and provide a service for patients that is informed and responsible. Managing the radiation dose from pediatric CT. Appl Radiol. Dr. Lai is a Resident in Radiology, Beth Israel Deaconess Medical Center, Boston, MA. Dr. Frush is a Professor of Radiology, Division of Pediatric Radiology, Department of Radiology, Duke University Medical Center, Durham, NC.